The end of the Cold War literally transformed the purpose and shape of the Spektr module. The spacecraft was developed for a top-secret military program code-named "Oktant." Within "Oktant," the Soviet Ministry of Defense planned a series of experiments in surveillance in space and tests of technology for antimissile defense. The experiments would continue the research in the field started onboard top-secret TKS-M module, which docked to Salyut-7 in 1985 under an official "cover-up" name Cosmos-1686. A set of surveillance instruments and the launchers for artificial targets were mounted on the exterior of the module, while a control station was set up for a specially trained researcher. An experimental optical telescope code-named "Pion" was the heart of the Spektr payload. However, with the end of the arm race and shrinking of Russia's space budget at the end of the 1980s, the Spektr module stuck on the ground for indefinite future. Russian officials reportedly considered launching Spektr and its sister-ship - Priroda module - to the International Space Station. The rescue came in mid-1990s with the resurgence of the US-Russian cooperation in space. The Spektr was quickly refurbished for the new mission: to house experiments for the cooperative program. The module's military payload was replaced with the new conical-shaped section housing a second pair of solar panels, which would improve Mir's ever-diminishing power capabilities provided by its aging solar arrays. A Phaza spectrometer remained the only "rudiment" of Spektr's military past, when the module make it into orbit in May 1995. The propulsion system onboard Spektr featured small 11D458 and 17D58E thrusters developed at NIIMash. The Spektr turned out to be the unluckiest piece of Mir. In 1997, the Progress cargo ship, which went astray during remote-controlled docking experiment, hit the Spektr and its solar panels. The collision caused depressurization of the spacecraft and almost cost the crewmembers of the station their lives. Fortunately, they were able to severe the cables leading to the module and close the hatch connecting it with the rest of the station. Later, the hatch leading into Spektr was replaced with a special plate carrying airtight interfaces for the power cables. In the course of the so-called "internal" spacewalk into depressurized module, the cosmonauts run power cables from Spektr's undamaged solar panels to the hatch. As a result, the space station was able to reclaim the electricity generated onboard the sealed module. All attempts to pinpoint the exact location of the air leak onboard Spektr and to repair it proved fruitless, leaving the Spektr off limits for the rest of the station's lifetime. 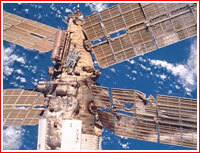 During the latest, expedition to Mir in the spring and summer of 2000, the cosmonauts discovered that a small leak, which bothered mission control since summer 1999, was caused by a small test valve in the plate, which seals off the Spektr. The leak was reportedly isolated in a matter of seconds.